VacMaster Vacuum Chamber Pouches can be used in any brand of vacuum chamber machine. Vacuum Pouches are perfect for sealing moist products, soups or doing Sous Vide. 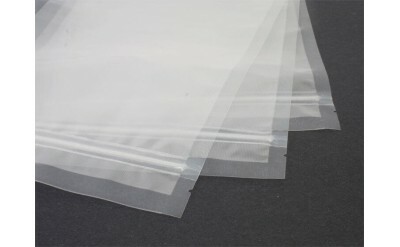 These vacuum chamber pouches are quality made, 3 mil thickness and sold in a variety of sizes. We carry Zipper Vacuum Chamber Pouches too! The VacMaster® Vacuum Chamber Pouches with re-closeable zipper seal help keep food fresh up to five times longer than traditional food storage bags! Made of heavy duty 3-mil thick material, their nylon / poly construction provides high puncture and abrasion resistance. One end of the bag has a conve.. These 6" x 10" Vacuum Chamber Pouches with re-closeable zipper seal help keep food fresh up to five times longer than traditional food storage bags! Made of heavy duty 3-mil thick material, their nylon / poly construction provides high puncture and abrasion resistance. One end of the bag has a conve.. These 6" x 8" Vacuum Chamber Pouches with re-closeable zipper seal help keep food fresh up to five times longer than traditional food storage bags! Made of heavy duty 3-mil thick material, their nylon / poly construction provides high puncture and abrasion resistance. One end of the bag has a conven..